A long way back in the history of the "Taming of the West," steel companies began manufacturing a new combination of steel wire with sharp barbs attached, capable of causing serious injuries to any human or farm animal who came into contact with it. It is still used today, and very effectively, to keep livestock from wandering into prohibited countryside. The first patent in the United States for this product was named "barbed wire," and was issued in 1867 to Lucien B. Smith, regarded as the inventor. Another inventor by the name of Joseph Glidden got his finger into the pie, and in 1874 received a patent for the modern invention of today's barbed wire after he made modifications to previous versions. Since that time, millions of miles of barbed wire have been attached to posts and stretched all across the West. A lot of it is still where it once was used to keep livestock where it belonged. But now it's invisible; it's no longer standing, it's lying on the ground next to the rotted posts that once helped it stay vertical to the surface and visible. That fallen wire has since been catching animals of every description. 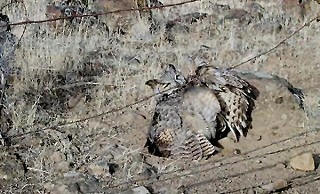 It was the wildlife rehabilitation community that brought the barbed wire dilemma to light. Eagles, hawks and owls started coming in to the rehab facilities for treatment, along with crippled deer, elk, wild horses and other wildlife. Hunters, hikers, photographers, wildlife researchers and people recreating where the fences once stood started finding injured and maimed animals caught in its barbs, and in a very short time these casualties brought forth an official effort to do something. Enter the Dechutes County Juvenile Corrections Department, and wildlife rehabbers Gary and Kellie Landers of Sisters. That combination of forces has been making the Central Oregon landscape safe for everyone by removing tons -literally tons - of that forgotten rusty, barbed wire. As of this moment, over 40 tons has been taken to recycling facilities, removed from our landscape by young men and women who have run afoul of the law. "That's a drop in the bucket compared to what is still out there. I am amazed at the reluctance of people to have it removed. It's not keeping anything in and certainly not keeping anyone out of their property. It's a free service for those in Deschutes County, and it gives their property a facelift. It looks cleaner and more open without the nasty stuff, and everyone's a lot safer with it gone!" The main thrust of the juvenile work program is to prevent offenders from having to go to court for their crime. If a juvenile offender will sign a work agreement and stick to the contract, not only is the costly court appearance eliminated, but the offender has the opportunity to see first-hand the positive parts of the project he or she is involved in. Not only does community service serve as a vital and effective tool in holding youth accountable for their offenses, it supplies a restorative philosophy and approach to the community service program by viewing a youth's service as more than just punishment for their offenses - but as an opportunity and obligation for the offender to repair the harm they have caused to their victim(s) and the community. The next time you're out walking and trip over a strand of barbed wire on your land, call the County Juvenile Welfare system and ask them to send someone out to remove it. If it's BLM land, call the Bureau of Land Management in Prineville; USFS land call the Bend office; State land, call the Bend office. You might also call Kellie Landers at 541-213-4411. Not only can the wire be removed and recycled, but the effort to get it done will help a lot of young people to recycle their lives, too.